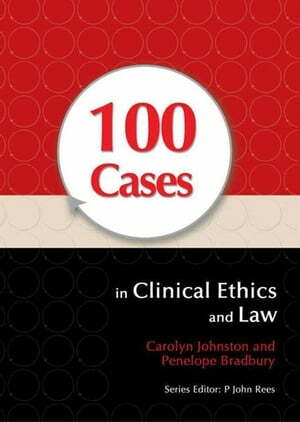 Collins Booksellers - 100 Cases in Clinical Ethics and Law by Johnston, Carolyn, 9781444112993. Buy this book online. A 70-year-old woman bed-bound following a stroke has developed bronchopneumonia, but her daughter produces an advance directive that she says her mother has written, which states that no life-sustaining treatment is to be given. How are you going to proceed? A practical guide on how to approach the legal and ethical dilemmas that frequently occur in hospital wards and medicine in the community, 100 Cases in Clinical Ethics and Law explores typical dilemmas through the use of 100 common medical scenarios. The book covers issues such as consent, capacity, withdrawal of treatment and confidentiality, as well as less-frequently examined problems like student involvement in internal examinations, whistle-blowing and the role of medical indemnity providers in complaints. Each scenario has a practical problem-solving element to it and encourages readers to explore their own beliefs and values, including those that arise as a result of differing cultural and religious backgrounds. Answer pages highlight key points in each case and provide advice on how to deal with the emotive issues that occur when practising medicine, at the same time providing information and guidance on appropriate behaviour.